In this tutorial, we will see about Jenkins tutorial. Before going to Jenkins, let’s first understand continuous integration. Developer commits code to the shared repository on a regular basis. If the build is not successful, developers will be notified. If the build is successful, it will be deployed to the server. Let’s understand this with help of scenario. Let’s say you are working in large team of 10 developers. Developers were working on different tasks and committed code continuously and built was made after some days(let’s say 20 days) and deployed to the server. There are lots of bugs in the code at time of testing, how will you detect and identify the issue and who might be responsible for this bug? All developers are continuous committing the code. With each commit, a build will be triggered and tested and build fails, develop will be notified.In this case, it is very easy to detect and fix the issue. 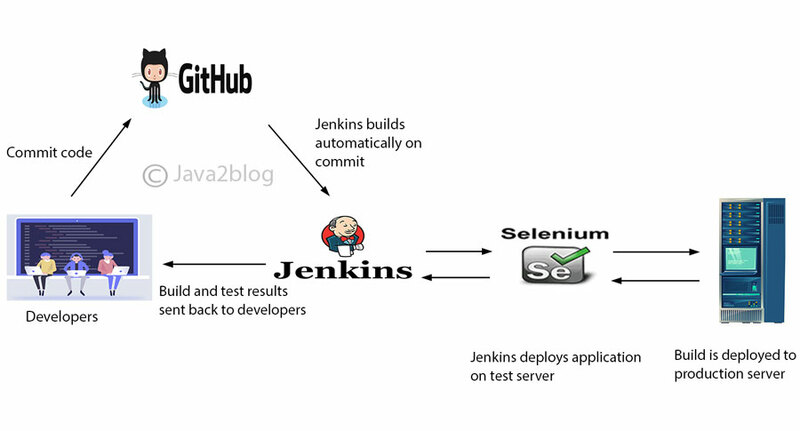 Jenkins is open source tool for continuous integration and build automation written in java. It is used to manually, periodically or automatically build software development projects. Jenkins can be used by team of different sizes for various projects. The main function of Jenkins is used to execute predefined steps such as compile java code, build war.You can trigger build on time basis or event basis. for example: every 15 mins or new check in the git. Build the project with help of maven or gradle. Run the test automatically and generate test report. Here is a diagram to demonstrate the functionality of Jenkins. Code quality metrics to assess developers commits. Build the job distributed by Master. Jenkins starts a separate program named “slave agent”.When slaves are subscribed to master, master starts distributing work to slaves. Job/Project Jenkins seems to use these terms interchangeably. They all refer to runnable tasks that are controlled / managed by Jenkins. Build Result of one run of a Project. Completed build A build is completed, if it was started and finished with any result, including failed builds. Successful build A build is successful when the compilation reported no errors. Broken project A project is broken if its most recent (completed) build is broken. Slave Slaves are computers that are set up to build projects for a master. Jenkins runs a separate program called “slave agent” on slaves. When slaves are registered to a master, a master starts distributing loads to slaves. Node Node is used to refer to all machine that are part of Jenkins grid, slaves and master. Executor Separated stream of builds to be run on Node in parallel. Node can have 1 or more Executors. Special executors can be created dynamically (one-off executors) to run lightweight jobs used mostly for orchestration purposes. Please note that you need to install Jenkins before proceeding further, else you will get 404 error at localhost:8080. Step 2: Login with username and password which you might have created while setting Jenkins. Step 3: Click on “create new jobs”. Step 5: Scroll down and go to build section. 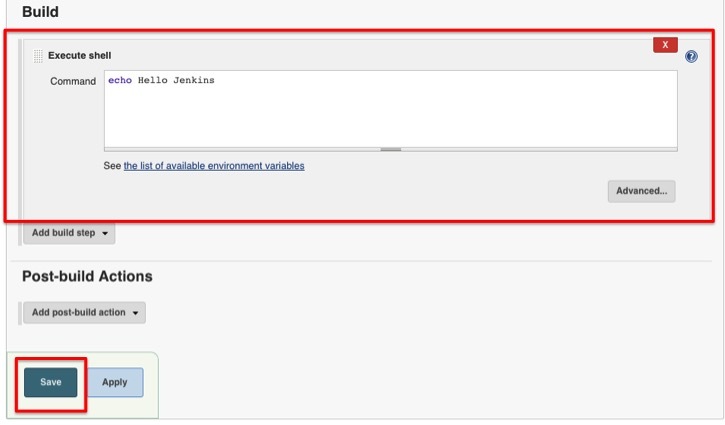 Select “Execute shell” from dropdown and write “echo Hello Jenkins” in command text box. step 6: Click on “build now” from left menu. step 7: You will see build history section in left menu. Click on #1 to get more details. step 8: Click on “Console output” from left menu.You will be able to see the results of the build. That’s all about Jenkins tutorial. 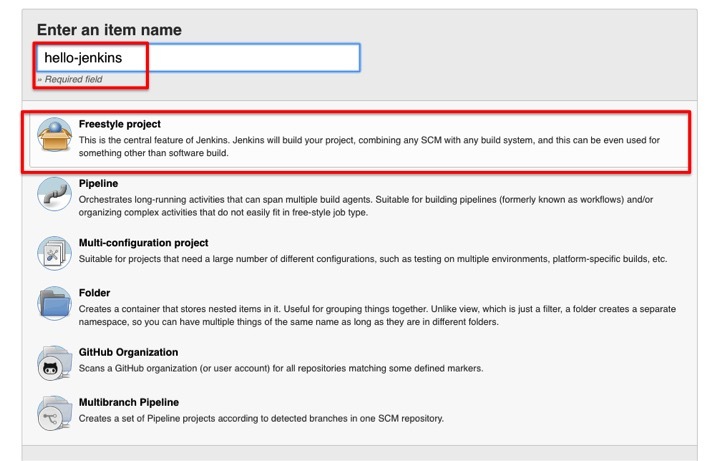 I hope you will be able to create Jenkins jobs after going through this Jenkins tutorial.